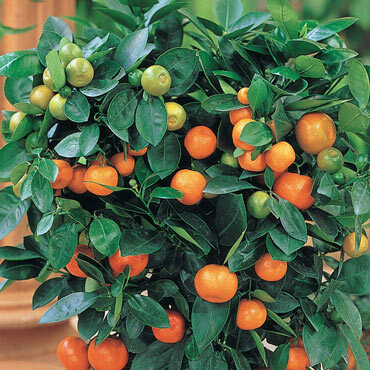 Your home can be a true tropical paradise with our Dwarf Calamondin Orange tree! Its white, fragrant flowers sit atop a bed of dark green and glossy foliage. When you see those blossoms, you'll know that the fruit isn't much further behind! Calamondin Oranges are small and juicy, with a unique tart flavor. They're delicious peeled as a snack, or make a curd out of the juice and add to pies or other desserts. In the winter time, be sure to keep this plant indoors. When mature, its height will be between 4-6' tall. Self-pollinating. Zones 9-10. Ships in 3" pots. Spacing: 1 plant per pot. If planting in the ground in zones 9 - 10, space 4 - 6 feet apart. Zone: 9 - 10 (30° F.). Fruit: Small, juicy, tart oranges. Fruit has seeds. Soil Preference: Well-drained, rich, moist, sandy loam soil. Pruning: Late winter pruning helps promote a more compact look.